I have already reviewed this title already very early in my blog,but in all fairness it never got that many views,but watching it again the other day, I feel I had to write about it again. It is a 90 minute pure adrenaline ride,a survivor film,with one man in an alien environment. Now Jack O'Connell is certainly making big waves in the UK at the moment,and this being his third film,with Starred Up and Unbroken behind him already, A Bafta winner for best new comer as well,and also a local lad, from Derbyshire,West Midlands. 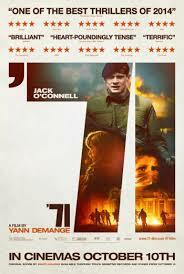 Now I'm not going into politics,but this film is about the troubles in Northern Ireland in the early seventies . Jack O'Connell plays a young British Army Soldier,just out of basic training,with this being his first deployment. His job Is simple to assist the RUC making arrests in a Catholic Area of Belfast. When the locals start banging the dustbin lids to warn members of the IRA. A riot ensures and he and another solider is left behind in the hasty retreat. With the other Solider being brutally murdered in the street in broad daylight by an IRA member. With Jack running for his life in an Alien Environment,with teraced houses everywhere every street looking identical. With a target on his back being in a British Army Uniform. What I did like about this film, is that it showed no side to be right or wrong,each were aggressive,and also very human too. It showed the goodness in the human kind,and the worst side. And was not on either side judgemental. A fantastic film that had me on the edge of my seat for the entire film,with Jack O'Connell superb in rhis,a true star in the making.